Perennial Public Power District’s board of directors recently voted to partner with Bluestem Energy Solutions out of Omaha, NE to study and develop a potential wind energy project within Perennial’s service area. Perennial’s current wholesale power contract with the Nebraska Public Power District allows Perennial to generate a portion of its energy from a renewable energy source. “Because our NPPD contract allows us this option, we feel it is worth looking into the details and identify any benefits for our ratepayers. Potential benefits include: financial savings, economic development activity within the district and adding some renewable energy to our current portfolio”, says General Manager Jamey Pankoke. The proposed project would be located within Perennial’s service territory. There are numerous factors that go into choosing the specific site which include the terrain of the land, environmental concerns and characteristics of the wind resource. “Today’s utility industry faces many new risks and unknowns. Due to increased regulation of coal and nuclear facilities, transmission security, water usage in regards to electric generation, global commodity fluctuation, new fuel sources, changing models, new customer demands, environmental concerns, rising prices and many more, we feel that some local generation may offer Perennial and its rate payers some certainty, security and stability for the future. This project would also pay property taxes, land owner lease payments and provide new economic activity for years to come”, states Pankoke. 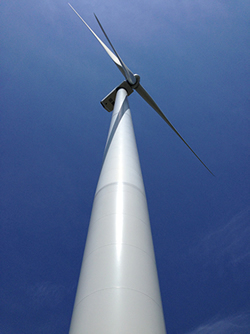 According to the American Wind Energy Association electricity generated from new turbine technology installed in the last five years has grown at a rate of 200 percent. Increased performance, production and reliability are the result of technology innovation and operational improvements, which has effectively driven down the costs while offering a better product. “The wind industry appears to have continued to provide more reliable technology at better prices. Based on the market data we are seeing this appears to be a responsible time for Perennial Power to enter into the wind industry”, says Pankoke. The development period will go through the end of this year. Perennial should have the data they need to make any final decision as to whether or not to go forward with the wind project by the spring of 2015.